This Diamond Bin & Dual Quarter Round Shelf Wine Rack Set holds up to 189 wine bottles, from standard Bordeaux size to Pinot Noir and Champagne size. 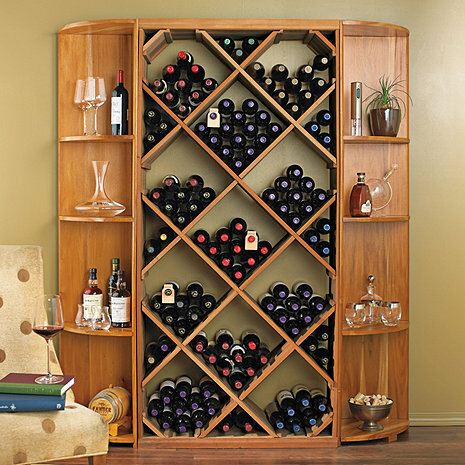 Plus 2 Quarter Round Shelf Wine Racks. This Diamond Bin & Dual Quarter Round Shelf Wine Rack Set holds up to 189 wine bottles, from standard Bordeaux size to Pinot Noir and Champagne size. Plus 2 Quarter Round Shelf Wine Racks. Six 3-bottle triangular side sections. Two 3-bottle triangular sections, top and bottom.